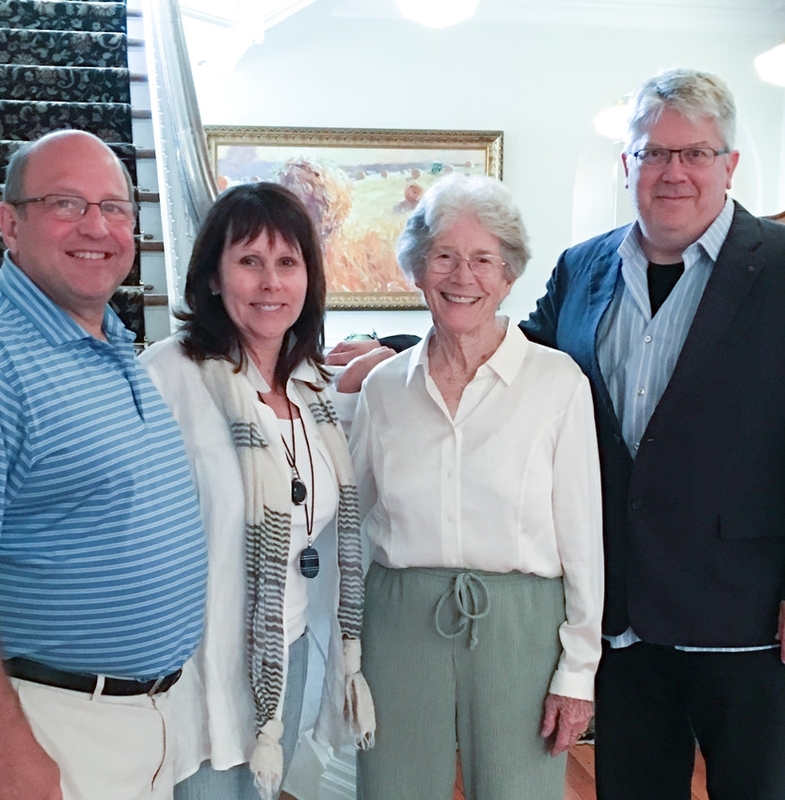 Alumni Ted and Leslie Belden (far left) with Martha Sutherland and Fay Jones School of Architecture and Design Dean Peter MacKeith. FAYETTEVILLE, Ark. – University of Arkansas alumni Ted and Leslie Belden of Fayetteville have made a $2 million planned gift to Campaign Arkansas that will support faculty, students and an endowment in athletics. Their gift creates the Cyrus A. and Martha Sutherland Endowed Chair in Preservation Design, the Sam Smith Endowed CARE Scholarship and the Roland Sales Endowment in Student Athlete Development. Each designation established by the Beldens carries significance behind its naming. As students at the U of A, Ted and Leslie Belden had Cy Sutherland as one of their professors in the then-School of Architecture, where Sutherland’s wife, Martha, also worked as a faculty member. Even after she graduated from the university, Belden took another course from Sutherland that was offered in central Arkansas. And when Belden was asked to attend a meeting that Sutherland had to miss, it resulted in Belden being named secretary of the Historic Preservation Alliance of Arkansas. “I’ve been committed to historic preservation ever since,” she said. The Beldens operate Old Buildings, a Fayetteville company that adapts and renovates existing structures or provides infill in historic settings. They, along with Sutherland, were instrumental in saving Carnall Hall from demolition and restoring the iconic building. “We believe that the Fay Jones School of Architecture and Design needs a graduate program emphasizing historic preservation because Arkansas needs more of its architects committed to, and knowledgeable about, protecting the culture of our state and the fabric of our older areas of towns and cities,” the Beldens said. The Cyrus A. and Martha Sutherland Endowed Chair in Preservation Design will be funded with $1 million of the couple’s contribution and used to support a faculty chair who demonstrates leadership in preservation design education, a mission of teaching, research and community engagement in practice and the ability to critically re-imagine the place and potential of historic places as an intrinsic element of contemporary design practice. The Sam Smith Endowed CARE Scholarship will be established with $500,000 and will provide financial assistance to prospective incoming first-generation freshmen who are admitted to the university. The scholarship, which is named after Leslie Belden’s father and grandfather – Milton Samuel Smith III and Milton Samuel Smith II, will give first consideration to students residing in St. Francis County, where Belden lived as a child. Belden’s grandfather, Milton Samuel Smith II, was superintendent of schools in St. Francis County, and her grandmother was principal of the elementary school. Belden’s mother and maternal grandmother taught in Forrest City, and her aunt was the high school librarian. Another $500,000 will be used to create the Roland Sales Endowment in Student-Athlete Development and endow the position of director of student-athlete development. The funds generated by the endowment will further the mission of the student-athlete development program, which prepares student-athletes for peak performance in life by equipping them with tangible skills and critical information that prepares them for college experiences and life after college athletics. The endowment is named after Roland Sales, a former running back for the Razorbacks who, as a student, set a record for the most rushing yards at the Orange Bowl in 1978. Both Sales and Belden were in a study group together, and their interaction as classmates led her to the realization that student-athletes deserve the life skills and education needed to achieve success after graduation. In addition to a Bachelor of Architecture, Leslie Belden also earned a Doctor of Philosophy in public policy from the U of A and a Master of Arts in Divinity and a Doctorate of Ministry from Louisville Presbyterian Theological Seminary. Ted Belden holds a Bachelor of Architecture from the U of A. The Beldens are members of the Campaign Arkansas Steering Committee and former co-chairs of the Fay Jones School of Architecture and Design campaign committee. They are also members of the Architecture Dean’s Circle, life members of the Arkansas Alumni Association and are designated as Thoroughreds for their 24 years of consecutive giving to the university. Leslie Belden is a member of the Women’s Giving Circle.